According to a recent report from the Tufts Center for the Study of Drug Development, the total price tag for bringing a new drug to market can be up to $2.7 billion.1 While development costs are high, keeping costs low during commercial production while delivering products that are safe for human use are key components of market success. Over the past decade, there have been major improvements in process understanding that have resulted in more efficient processes that meet market demands for high-volume, blockbuster therapies. Improvements have also been made in the efficiency of small-volume, microscale processes to the point where patient-specific therapies are a reality. To help meet the needs of both large- and small-scale processes, suppliers of sterilizing-grade filters have developed new products and technologies and, in some cases, optimized existing products by creating new sizes or formats. 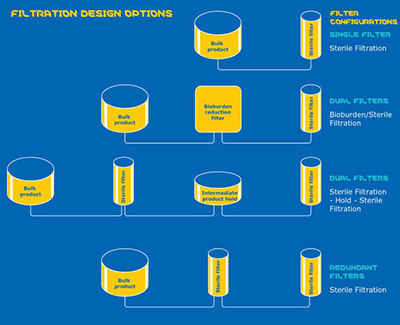 Although the fundamental function of sterilizing-grade filters is to control bioburden and provide sterility assurance, there are many more filtration product offerings today that can improve efficiency and expand flexibility in process design. Industry trends toward intensified processing and increased implementation of single-use systems are changing approaches to sterile filtration and bioburden control in biomanufacturing processes. These trends have adjusted expectations for both suppliers and manufacturers by providing confidence and safety assurance for their products. Process efficiency means different things, depending on your perspective. For upstream processes, it may be more productive cell culture processes or increased confidence in more reliable, uninterrupted production. High-profile bioreactor contamination events that resulted in plant shutdowns and disruptions in drug supply highlighted the criticality of raw material sourcing and comprehensive risk analysis for cell culture media components. Filter suppliers met this need for improved microbial retention with specialized filters that not only provide sterilizing-grade performance but also remove other high-risk microbial contaminants, such as mycoplasma and adventitious virus. These filters, containing membrane with smaller pore sizes than the traditional 0.2 µm sterilizing-grade membrane, are now routinely used to reduce the risk of bioreactor contamination and consequent production interruptions. These complex bioreactor feeds often contain a high concentration of components that would plug traditional sterilizing-grade filters. High-capacity filters that maintain flux in the presence of filter-fouling components have been developed to efficiently process these fluid streams. Additional flexibility is achieved by implementation of high-area filters that offer a large area of high-capacity membrane in a small filter footprint. These types of innovations can improve process economics and facility fit. For downstream operations, process efficiency may mean higher yield, faster processing, or higher loadings on individual unit operations. 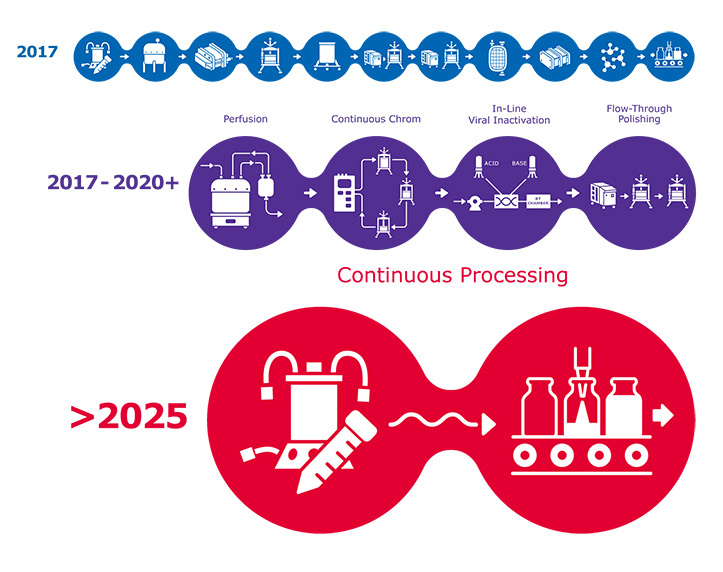 Purification challenges are being met by modifying traditional downstream operations from batch to intensified operations with either hybrid systems of batch and flow-through operations or fully continuous flow-through operations (Figure 1). Although purification operations are often a focus for improved efficiency, as existing processes are modified or new processes are developed, sterile filtration operations are also often reviewed for potential efficiency improvements. Traditionally, sterilizing-grade filters have been used at multiple points in downstream processes. Prefilters, with their generally lower costs than sterilizing-grade filters, are increasingly being implemented to extend the life of sterilizing-grade filters and reduce the overall costs of filtration. In some cases, prefilters with bioburden reduction claims can be used as stand-alone filters and offer a lower-cost alternative to sterilizing filters for bioburden control at intermediate process steps, such as column protection. These types of filters may also be appropriate for processing buffers where bioburden control, rather than sterility, is the objective. Risk analysis tools can help understand the needs for bioburden reduction or sterile filtration at different process steps and will guide selection of both the appropriate filter type and its performance requirements. In addition to the filtration devices or technologies, suppliers are thinking about ease of use in integrated system flow paths. Design features on filters are being modified to improve the user experience, minimize operator errors, and increase connectivity. In addition, suppliers are developing technologies to simplify digital integration of their products into biomanufacturing operations. New scannable labels afford simpler inventory management, easier ordering, and more direct access to supplier information as well as expanded options for increased connectivity to automation and electronic data management systems. As these features become more widely available, today’s manufacturers have many more options for sterile filtration than the one-size-fits-all sterile filter of a decade ago. The flexibility of single-use systems is particularly attractive in the final sterilizing filtration of the drug product. Single-use offers clear advantages in final filtration by reducing the risks of product contamination and offering increased efficiency for process changeover as compared to traditional operations. Specialized sterilizing-grade filters have been developed for final filtration; these filters have a novel design format that reduces hold-up volume and maximizes product recovery. Other modifications to the filter housing make these filters easier to use and easier to integrate into single-use systems. For final filtration of highly-purified, concentrated drug product, filters such as these that offer sterilizing-grade performance combined with features that simplify operation and reduce operator errors offer many benefits to biomanufacturers. The complexity of requirements to assure suitability of single-use system components for biomanufacturing has resulted in a much closer relationship between manufacturers and their suppliers, as manufacturers leverage the supplier’s expertise, experience, and technical know-how to help meet their needs. As processing systems have evolved, there has been increased focus on integrity testing and filtration system design, particularly around the final sterilizing filtration before filling. Regulatory requirements, risk profile, facility fit, and costs are all considerations that affect the final filtration system design. These systems can include single or dual filters where one or both may deliver sterilizing-grade performance (Figure 2). Although a single sterilizing-grade filter will provide sterility assurance, redundant filtration reduces the risk of compromising sterility and of having to discard a batch of processed drug product should the single-sterilizing grade filter fail integrity testing. Irrespective of their position on the risks and benefits of PUPSIT, it is important filter suppliers support their customers’ needs by designing and validating systems that minimize the risks of PUPSIT. Specialized barrier filters containing hydrophilic and hydrophobic membrane layers offer opportunities for simplified system design by enabling filter flushing with water and subsequent blow-down with air (Figure 3). However, even with these filters, verifying filter integrity post sterilization in a redundant filtration train remains a challenge for many biologics manufacturers. There is no one common design for a single-use, final-filling system, and designs are based on each user’s risk analysis. A robust system design requires extensive knowledge and understanding of the drug product, operating conditions, filter performance, and regulatory requirements. Suppliers are designing new products for use in biopharmaceutical production processes, with features that maintain sterility while simplifying operations and improving digital integration. Biologics manufacturers have many decisions to make when identifying the appropriate filters for a process and when designing and validating the filtration system. Collaborating with a supplier with experience in both filtration technology and single-use systems can provide confidence as they work together to maximize the efficiency and improve the economics of drug production. 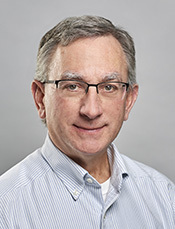 Randy Wilkins has over 30+ years experience supporting the biopharmaceutical industry in the areas of sterilizing filtration, integrity testing, sterilization process design, filtration system design and regulatory compliance. He has co-authored papers on bacterial retention, filter selection processes, and validation of extended use of sterilizing grade filters. He has contributed to PDA as a member of the Steam-In-Place task force and Sterile Filtration Quality Risk Management task force. Over the years he has held several positions at Millipore, primarily technical support, and also R+D, operations and Technical Training. 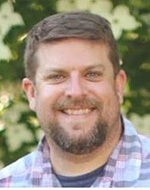 Matt Daley is currently the head of the Biosafety Product Area for MilliporeSigma, responsible for sterile and virus filtration. He has worked in the life science filtration industry for 18 years including roles in technical service, customer support and marketing.